Handcare is an essential part of any beauty regime, particularly in the cold winter months. 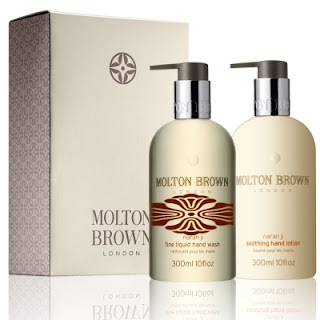 Hand wash and lotion duos are a necessity in any chic bathroom, especially when you are expecting guests and Brit brand, Molton Brown, offer some of the best. I adore the sweet orange scent of Naran Ji whilst one of my good friends favours Thai Vert. Another brand which instantly springs to mind when thinking of handcare is L'Occitane whose Shea Butter Hand Cream is renowned as a cult beauty product. For Christmas, the French brand has released a limited edition trio which pays tribute to the African origins of the wonder ingredient, Shea Butter. They're not attractive but I swear by Bliss Spa's Moisturising Gloves. For Christmas, they've released the appropriately named, Two Turtle Gloves gift set.